Album containing twenty-seven vignetted albumen prints including photographic frontispiece titled Typen der Bewohner des Amurgebietes Nach Der Natur Photographirt [.......photographed from life], each approx. 87/8 x 7¾ in., extensive retouching to most negatives and some retouching on print surfaces, inserted in sealed arched-corner gilt-edged mounts, each titled in German on mount, brown leather (front cover detached), titled in gilt on front cover, g.e., 14¼ x 12¼ in. Elliott, Photography in Russia, 1840 - 1940, p. 43. An unusual album of ethnographic portraits from this remote region of far eastern Russia, at the border with China. The peoples represented are described as Daüren, Mangüne, Samagoz, Golde, Ailjak, Orotche and Bureate. Portraits include individual adult male and female subjects and family groups with children. Several are full-figure studies and include details of costume. In some the sitters are smoking pipes, others include 'props' such as animal pelts and fish. 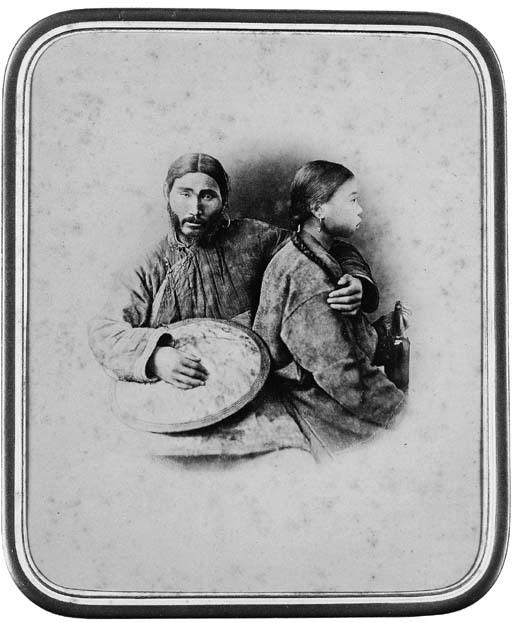 According to David Elliot, by the 1870s "Russian photography was not only developing in St. Petersburg, Moscow and the large provincial capitals - professional and amateur practitioners also emerged in far-flung provinces. Many of them made a great contribution to the emergence of regional studies. The Album of the Amur and Ussuriiskii Regions, which the St. Petersburg Public Library acquired in the mid-1870s from an Amur merchant, is an excellent example. This three-volume work was compiled by V. Lanin, a local photographer." It is possible the photographs in this, as yet unidentified, album may be by the same photographer.